presented in a most non-traditional way. Make a Joyful Noise like you’ve never imagined it before! Reprinted courtesy of The Hill, Journal of Clinton Hill, Fort Greene & Wallabout, Brooklyn. Does this sound like Fort Greene and Clinton Hill in 1999, with the lavish rhythms of its trendy café culture and the bounteous beat of Bogolan vying for the public ear along with such thriving musical enterprises as the BAM Next Wave Festival, 651 ARTS Center, Cultural Crossroads, or the Brooklyn Contemporary Chorus? Could be, but before you pack off to Chez Oskar or Brooklyn Moon for a dose of today's thick Brooklyn sound, flip back the calendar a century or so to the heady Gilded Age, when "the Hill," newly middle-class, was taking up the melodic arts in a decidedly upbeat manner. Turn to April of 1880, for example, when the acclaimed "colored" Fisk Jubilee Singers made appearances at the Hanson Place Methodist and the Lafayette Avenue Presbyterian churches. Or to November 22, 1893, when the Lafayette Avenue church welcomed "the only Kaffir Choir of the world" from southern Africa, according to an item in George C.D. Odell's comprehensive Annals of the new York Stage. Pick almost any year in the last third of the 19th century, when the Seven Corners area (around the intersection of Fulton, Hanson Place, And South Oxford) held court as American's "Hymn Pan Alley." It was a veritable hotbed of popular music-making that produced some of the most enduring tunes and lyrics in the American evangelical Protestant tradition, some of which have crossed over into popular culture. Modern-day moviegoers who enjoyed "Shall We Gather at the River?" in films such as Rosewood or Trip to Bountiful probably never suspected that the song is a Fort Greene original, written in 1864 at the Hanson Place Baptist Church (now the Seventh Day Adventist Church) by its pastor, Rev. Robert Lowry. One of his church members, Annie Hawkes, wrote the supremely popular "I Need Thee Every Hour," which skyrocketed to popularity in the late 1800's, coinciding with a period of fervent capital-vs-labor agitation over the six-day, 60-hour week. Who knows today that the prolific Fanny Crosby, the blind composer and lyricist who wrote "Blessed Assurance" and more than 6,000 other songs and hymns during their 95-year life span, lived for a while on Lafayette Avenue and was a familiar figure at revival meetings in local churches and at the old Clermont Skating Rink? Or that Ira Sankey, a household name in American music of the late 19th century, was a resident of south Oxford Street, where he presided over Bigelow and Main, one of the most prominent music publishers of the era? From the 1870's, Sankey had achieved prominence as the musical partner of preacher Dwight Moody, whose traveling evangelistic crusades provided spectacle, song, and shared experience to an American society just before such spiritual extravaganzas were eclipsed by the advent of the more secularized mass gathering provided by film, radio, and later television. Moody and Sankey, who met for the first time during a revival meeting thwarted by the Great Chicago Fire of 1871, were the ancestors of more recent pulpiteers like Billy Graham and Oral Roberts, as well as a sometimes less-than-heavenly host of televangelical impresarios. Neighbor Sankey composed more than 1,200 songs during his lifetime; some of them, such as "Shelter in a Time of Storm' and "The Ninety and Nine," embellished with today's Nashville sound, have become pop standards on contemporary Christian radio. Some of his compositions were sung at his funeral in 1908 at the Lafayette Avenue Presbyterian Church, where a bronze tablet was placed in his memory some years ago. A cynic might conclude that payola and commercial influences on music started in Fort Greene during its "Hymn Pan Alley" period. An example is Fanny Crosby's signature song "Blessed Assurance." Fanny wrote the words at the home of her patroness, Phoebe Palmer Knapp, just after Phoebe had plunked out the original tune on the piano in her Bedford-Stuyvesant parlor. Fanny's immediate reply was "Why Phoebe, that sounds like 'Blessed Assurance' to me." Surely, Mrs. Crosby could not have been unmindful of the fact that her patroness's husband, Joseph Knapp, was president of a major New York life insurance company-then called an assurance company. This tongue-in-cheek reference to Mr. Knapp's "assurance" business was not so much and impropriety as a subtle commercial for the enterprise that enabled Mrs. Knapp to hold salons at which she and Fanny played their latest compositions. Or take the case of Dr. Cleland Boyd McAfee, pastor of Lafayette Avenue Presbyterian from 1904 to 1912, and author of the enduring hymn "There Is a Place of Quiet Rest, Near to the Heart of God." Shortly after writing these words, Dr. McAfee became one of the few male patients of the prominent Philadelphia physician Dr. S. Weir Mitchell, who was gaining a huge reputation in pre-Freudian America for his practice of ordering "rest cures" for his neurasthenic female patients. For several years in the early 1900's, Dr. Mitchell carried on a behind-the-scenes campaign that eventually persuaded the elders of the Lafayette Avenue church to send Dr. McAfee and his entire family to Europe for a year-long rest cure in 1908. Again, in an era before mass communication, when church hymns might have served as precursors to the radio jingle, had Dr. McAfee unwittingly written an unofficial theme song ("There Is A Place of Quiet Rest") for Dr. Mitchell? Robert Lowry, by the way, reported that he had written "Shall We Gather at the River' on Hanson Place one sweltering July afternoon in 1864, while he was "lying on a lounge in a state of physical exhaustion." Thirty years too soon for Dr. Mitchell. Another prominent Fort Greene musician of the day was Dr. John Hyatt Brewer, organist at the Lafayette Avenue church for 50 years (1881-1931) and the founder of several choral societies that flourished in the neighborhood a century ago. In 1907, his new cantata "O God, the Rock of Ages" was introduced to mark the 50th anniversary of the founding of the church. Most people know "Rock of Ages" sung to the tune called "Toplady," but Dr. Brewer composed a new tune for the hymn and titled it "Cuyler" after the church's founding pastor, the Rev. Dr. Theodore Ledyard Cuyler (another South Oxford Street resident). For nearly 100 years, the "Cuyler" was sung at every communion service at the church, which dropped the practice only in the 1990s. Brewer, who was also instrumental in introducing the work of important French composers to American churches and concert halls, ended up living in the same building as poet Marianne Moore at 260 Cumberland Street. He died there in 1931. When Dr. Brewer composed his new rune, he called it "Cuyler," which is how it was titled in the 1907 Plymouth Hymnal. It wasn't until 1908 that the Brooklyn Academy of Music took up residence on Lafayette Avenue, replacing its earlier incarnation on Montague Street-another sign that the cultural fulcrum of Brooklyn was shifting into new territory. Before the advent of theaters and concert halls in the area, most musical entertainments took place in local churches, according to Odell's "Annals of the New York Stage" and other accounts. Today, thanks largely to Harvey Lichtenstein's legacy, BAM is regarded as a true world stage, the incubator of some of the planet's most creative energies. But by the early decades of this century, the "Brooklyn Institute of arts and Sciences" had emerged as an important venue for contemporary music. Even before Marianne Moore moved to Cumberland Street in 1929, she had crossed the river to attend the Academy's important performances during the ferment of the 1920s. In her 1960 essay "Brooklyn from Clinton Hill," Miss Moore described with characteristic syntax how an all-Stravinsky program she attended on February 16, 1927, still echoed in her memory, praising its "rapt preoccupation with nicety of attack, fire, and tempo, projected concentratedly and unthreatened, in a manner so intent as to disable judgment. I can hear him still-a puzzle in the perfection of hoarded intentionalness." Nor did Fort Greene's resident poet emeritus neglect to chronicle the evidence of vernacular (local) music among her neighbors. In a 1952 letter to Louise Crane, Miss Moore described an evening spent at the Carlton Avenue home of her "perfect dressmaker, Gilda, and her husband," Whose cluttered living room included "a guitar on the piano tilted up diagonal." As the 20th century gives was to the 21st, another musical renaissance is in full flower in Fort Greene/Clinton Hill, where its scores of local instrumentalists and singer continue the traditions of entertainment and uplift in cafés and restaurants along Fulton Street and DeKalb Avenue, or in local churches of theaters. At least one of them has persisted for nearly 20 years: Cultural Crossroads, founded in 1978. Its mission as a community-based arts-and-education organization included the presentation of annual jazz concerts with Dr. Billy Taylor. 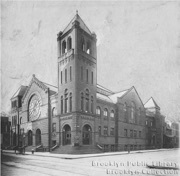 The series brought a roster of prominent musicians to the local stage at Lafayette Presbyterian, including such luminaries as Abbey Lincoln, Carmen McRae, Wynton Marsalis, Kevin Eubanks, Max Roach, Eddie Palmieri, Lionel Hampton, and the late Eubie Blake, who, well into his nineties, opened a concert in the Lafayette Avenue church sanctuary in the late 1970s with "Hosanna," a tune he claimed he hadn't played since his days as a pianist in a Baltimore bordello some 80 years earlier. Another significant local institution has been 651 ARTS, founded in 1988 to develop programming from as base within the Majestic Theater, a survivor of the vaudeville houses that once lined Fulton Street east of Flatbush. Under the leadership of Mikke Shepard and Dr. Leonard Gaines, 651 opened its inaugural season in 1989, and by 1992 had established an Artist Residence program. Its first resident artists included Donald Byrd, Opera Ebony, and the late Betty Carter, a neighborhood resident. It was 651 that co-commissioned and co-produced "The Harlem Nutcracker" by Byrd, and it co-presented the ballet's New York premiere with BAM in 1996. And in September of this year, 651 collaborated with Cultural Crossroads to present "Spirit! The Power of Music!" with Randy Weston and the Gnawa Musicians of Morocco. The new BAM Café, on the second floor at 30 Lafayette Avenue, has also started a series of Thursday-through-Saturday night performances featuring local talent among its roster of performers.